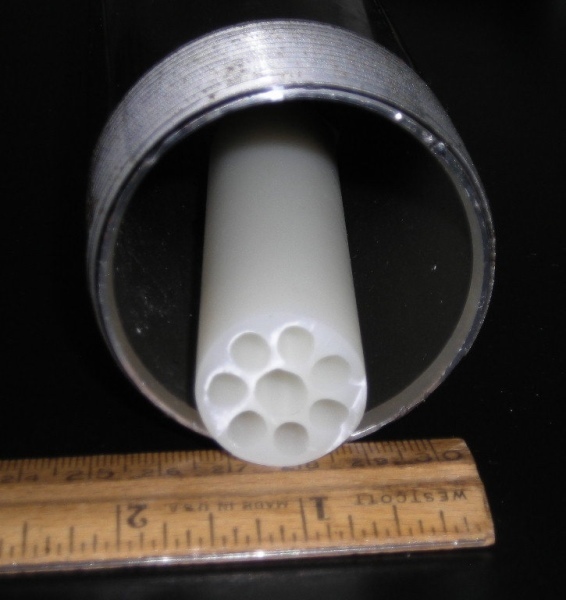 Multi-Channel (MCS) Production Tubing was specifically designed for wells that have liquid loading problems. As gas wells deplete, reservoir pressure declines, and gas velocity up the well decreases. Even if the gas-liquid ratio entering the wellbore is unchanged, sooner or later, liquid eventually starts to collect in the wellbore because the gas velocity becomes insufficient to carry all of the liquid out of the well. (restricts production rate and difficulty in kicking off). 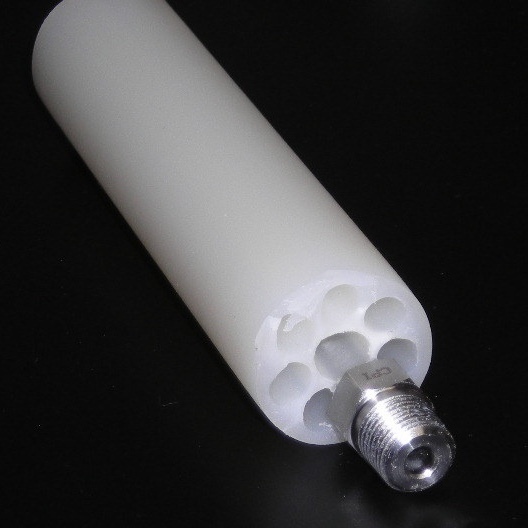 An MCS is a new type of "production tubing" that divides the flow up the well into multiple flows through small-diameter internal passageways. it reduces the "Turner Critical Rate" (i.e., minimum gas flowrate/ velocity) required to maintain steady state flow up the well (see "Turner Critical Rate" page)... and by utilizing multiple flow passageways, it compensates for the restrictive/ choking effects of using a single small-diameter passageway (i.e., velocity string). back down well, see drawing at right, "capillary bubble flow" pattern). the well can produce it, and it can be plugged later when depletion results in liquid loading. And the 5.5 mm-diameter passageways can be plugged one by one to maintain steady state flow and optimize the flowrate down to as low as 1 Mcf per day. In a sense, MCS production tubing "digitizes" the flow, improving flow management capability. Ultimate recovery is greatly increased, and without the costs and complexities of artificial lift. MCS production tubing requires no maintenance, no consumables, and no outside energy input. Kickoff is automatic (no swabbing) using the MCS Tailpiece (see "MCS Tailpiece" page). Particulates are produced along with the liquid, and the extrusion polymer is resistant to the buildup of salt, scale and paraffin. for the capillary injection of chemicals to prevent plugging. Utilizing the injector to supply gas, burst strength of the MCS production tubing exceeded the 550 psi limit of the testing equipment. MCS production tubing has tensile strength sufficient to permit utilization in wells exceeding 6,000 feet. Patents in the United States and Canada. The gas production chart for a MCS production tubing well has a unique signature, where the sporatic gas flowrate spikes are almost completely smoothed out.